In the highly sensitive areas, such as close to existing buildings or near historic buildings, static pressure can be used to minimize the impact of steel sheet piles on the environment. Piling = piling in hard clay when piling can be done using impact hammers. The current hydraulic hammer is very efficient and easy to control, as long as the pile hammer operation properly and the vibration monitoring, you can control the vibration limit, improve the success rate of piling, to ensure that the steel sheet pile has been in a vertical position, you can use the guide frame to achieve This requires: in addition, the appropriate size of the pile hammer, and the hammer along the axis of the sheet pile hit the center of the pile pile on the pile head once the deformation, you must immediately stop piling until you find out the cause and Improvement so far. If you encounter underground obstacles will lead to severe vibration, you can use the following methods to avoid this problem: (D excavation to 2 ~ 3m deep, to avoid the old concrete bricks, stakes or past the development of the past site left (Such as excavation may cause ground disturbance) ④ pre-drilling, so that hard soil loose. Estimation of vibration level In the past 20 years, construction units, schools and scientific research institutions have recorded a large number of ground vibration conditions at the construction site and summarized it into empirical formulas to assess the maximum pile hammer speed Its approximate upper limit (EN19935-1998). Static pressure pile if the use of static pressure piling, do not need a count, because in ensuring the verticality of the steel sheet pile, you can ignore the vibration effect 11332 vibration pile driver for the vibration pile driver, in the territory to use the rated power divided by the frequency , According to the information provided by the manufacturer, the unit of power is WaW: N · ms) The unit of frequency is MS, so the last unit is N. M / t, that is, J / ToD19935 recommended C = 07} 85228 suggested C = 1.0, preferred the former. 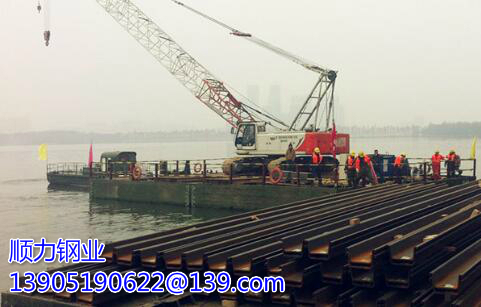 Part of the field records show that vibration piling often in the vibration frequency is low when the upper limit of vibration, which is the ground resonance response, "no resonance" vibration pile driver can avoid this situation. There are also some scholars [Hille (20¨) HOkyman (20 ⑩) that relative to the process of b encountered in the process of soil resistance, the unit cycle of the hammer energy on the impact of vibration more / small according to the current theoretical level, more reasonable In accordance with EN19935, the steel sheet pile manufacturer uses the energy cycle as a unit in the basic empirical formula.